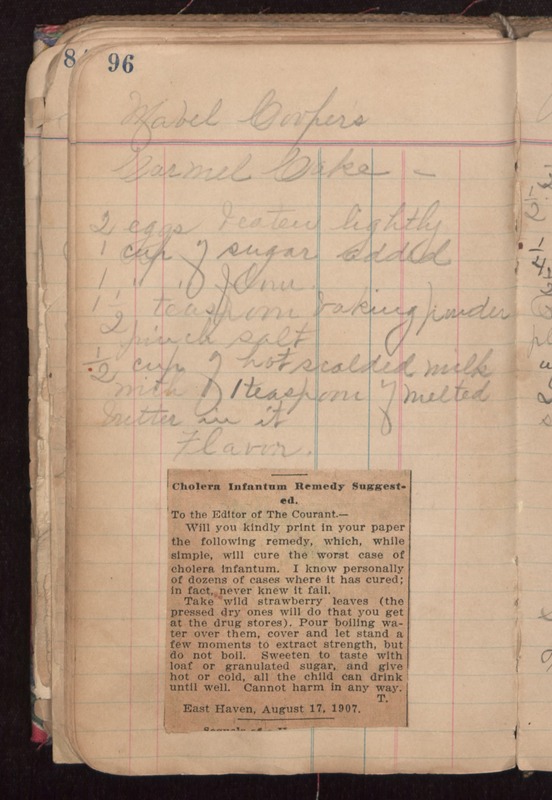 Mabel Cooper's Carmel Cake - 2 eggs beaten lightly 1 cup of sugar added 1 " " flour 1 1/2 teaspoon baking powder pinch salt 1/2 cup of hot scalded milk with 1 teaspoon of melted butter in it. Flavor Cholera Infantum Remedy Suggested. To the Editor of The Courant.- Will you kindly print in your paper the following remedy, which, while simple, will cure the worst case of cholera infantum. I know personally of dozens of cases where it has cured; in fact, never knew it fail. Take wild strawberry leaves (the pressed dry ones will do that you get at the drug stores). Pour boiling water over them, cover and let stand a few moments to extract strength, but do not boil. Sweeten to taste with loaf or granulated sugar, and give hot or cold, all the child can drink until well. Cannot harm in any way. T. East Haven, August 17, 1907.